I am looking forward to a major exhibition opening next month in Australia. 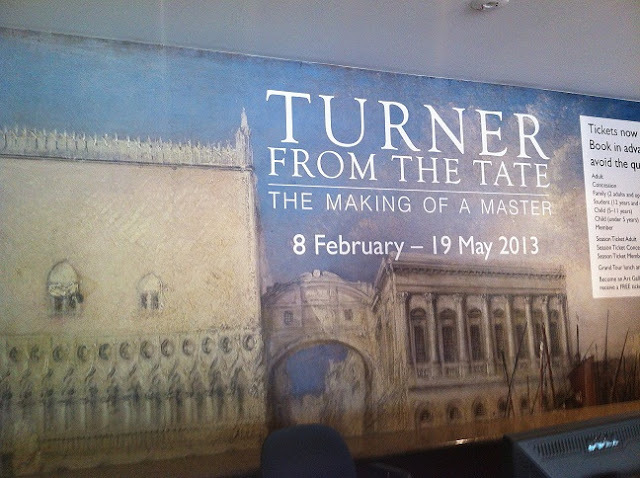 ‘Turner from the Tate: The Making of a Master’ will chart the development of J.M.W. Turner (1775-1851) as a master of the European landscape painting tradition. Britain’s Tate Gallery holds the largest collection of Turner’s works in the world as a result of the Turner Bequest, which was the artist’s gift to the British nation. The Turner Bequest contains all the works found in Turner’s studio after his death including around 30, 000 works on paper (watercolours and drawings) as well as 300 oil paintings. Many of the works in the Bequest are unfinished pieces or preparatory studies. This Australian exhibition will feature 110 works including 40 oil paintings and 70 works on paper including watercolours and sketches, including early works such as Buttermere Lake, with part of Cromackwater (1798) to the wonderful oil painting Venice, The Bridge of Sighs (1840). The media release for the exhibition also indicates that a watercolour, Bridge of Sighs (1840) will be included in the exhibition. Turner created over 600 paintings, watercolours and drawings of Venice, and the city forms one of the richest themes of his mature work. Between 1833 – 1846, he exhibited 25 paintings of Venetian subjects at the Royal Academy. He covered 500 sheets of paper in pencil sketches and executed around 100 watercolours. And yet - he is believed to have visited Venice just three times, spending the equivalent of only four weeks in the city. Turner first arrived in Venice in September 1819 at the age of 44 years. He stayed for five days. He returned to Venice in September 1833. He stayed for a week at the Hotel Europa, and produced around 200 drawings and a number of watercolours. He returned again in 1840 and this time spent around two weeks working in Venice. The Tate holds 280 of the artist’s bound sketchbooks, which have been digitised and are available for viewing on the museum’s website. I’ve been happily absorbed in Turner's Venice sketchbook from his September 1833 visit. The immediacy and vivacity of Turner’s sketches are captivating, and it’s thrilling to be able to sit at home in Australia and have such wonderful access to these drawings from the Tate collection. The exhibition Turner from the Tate: The Making of a Master’opens at the Art Gallery of South Australia (Adelaide) in February before travelling to the National Gallery of Australia (Canberra) in June.